So what is the AMWTC? In a nutshell it's a tasting competition, open to all, hosted by the Australian Scotch Malt Whisky Society, with a focus on fun. Whilst there are prizes, and those who take it very, very seriously, the focus is on having a good time - evidenced by the fact that not only can you buy tickets to enter the championship, you also buy tickets to spectate, while you enjoy all food and drinks from the Glenfiddich Bar, single cask SMWS drams from the SMWS bar, and sensory cocktails from our good friends at Sydney Cocktail Club. Having spoken to previous attendees, we're told it's an incredibly fun night (for entrants and spectators alike), and a good challenge for budding whisky fans The competition involves 8 well-known and commercially available drams, and a list of 9 from which entrants have to select their 8 (i.e. one is a red herring). 2nd: Cask Strength Survival Kit with a rare single cask Japanese single malt encased along with "all the tools you’ll need to go on your wild Society adventure"
3rd: Generously donated by The Oak Barrel on Elizabeth St as a $500 voucher to help you stock up on your single malts, wine, and beer. Dragon8's last Hong Kong auction, which we attended back in February, was quite a spectacle, with a number of rare lots going under the hummer - not just whiskies, but whole casks. Their next auction, being held this Saturday, 11th June looks set to be no different. Whilst wine is also featuring (including some incredible lots like full cases of DRC Romanée-Conti), it's the whisky we're most interested in, and it's no less impressive than last time around, with a selection of rare Japanese malts (Hanyu, Karuizawa), a large selection of Fine & Rare The Macallans, and most impressively, a world first - The Macallan 65yo in Lalique, which we tasted earlier this week. “Sourcing for this auction has come from several varied and distinct collections, including a major West Coast collection from the United States, a top private Hong Kong based collector and a variety of Dragon 8 friends and supporters. “As our name has become more well-known and trusted, several different consigners are coming forward,” says Lempert-Schwarz. Two that really pleased all involved were the reps of this U.S. based collection who contacted us with a selection of beautifully stored wines and the Hong Kong based collector who has a lot more than what we’ll be presenting on this day. Look forward to what else we’ll bring on the block from this major consignor." We'll be attending and bringing you the usual updates - always interesting to chart how rare whiskies are trending at auction, and they don't get much rarer than the whiskies Dragon8 auction. Last year Hendy wrote about Glenfiddich's first "Artists in Residence" competition in Australia, and the distillery has just announced that the competition will continue for a second year in 2016. “Submissions for the 2016 Glenfiddich Artists in Residence Prize are now officially open as William Grant & Sons brings the coveted art competition to Australia for a second time to celebrate the Glenfiddich commitment to the arts, and the communities it serves. Celebrating its fifteenth year globally, the program offers the winning artists a residency prize valued at $21,000, where they work and live for a period of three months (between April and October 2017) at the Glenfiddich Distillery in Dufftown, Scotland. The contest is an open call to all Australian artists who are welcome to use any art medium. These include, but are not limited to print, photography, animation, performance and installation. During the residency, the winning artist will create work taking inspiration from the distinctive location, history, heritage, people and craftsmanship of the distillery. An exhibition of the five finalist's work, along with a Glenfiddich pop-up bar, will take place at No Vacancy Gallery located at QV Melbourne from the 8th to the 13th of November. 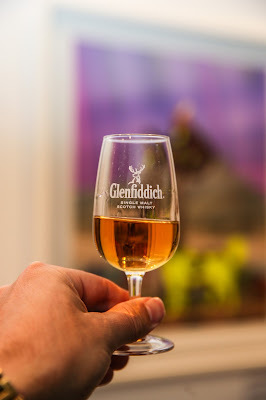 Guests attending the Glenfiddich pop-bar at No Vacancy Gallery can join the Glenfiddich Explorers Program and vote for their favourite piece of art. The Program is accessible to all whisky enthusiasts and offers numerous benefits at Glenfiddich hosted events. By voting, Glenfiddich Explorers will go into the running to win a collection of whiskies from the Glenfiddich range." Auchentoshan American Oak recently launched in the Australian market, coinciding with a new Beam Suntory campaign combining mixology and photography in a bid to discover Australia’s “Distilled Different” bar team. (Auchentoshan, of course, being the only Scotch whisky distilled three times, which definitely qualifies it as being "distilled different" in our books). “Twelve finalist bar teams will then be chosen and paired with an up and coming Australian photographer, scouted by art talent agency Art Pharmacy Consulting, who will create a body of work that captures the personality and essence of each team. The finalist teams’ images and cocktails will be displayed in exhibitions nationally where consumers and media alike will be invited to taste the differently distilled concoctions while enjoying the photographic showcase. One team will officially be named the Auchentoshan Distilled Different Bar Team of the Year and along with their partnering photographer, win a trip to Glasgow, Scotland to discover more about the home of the Scotch whisky." Exhibitions will take place between August and September 2016. Auchentoshan American Oak is available in Australia now and retailed for $59.90AUD. We'll have tasting notes (and maybe even an idea or two for a suitable cocktail) on the site in the coming month.